Hallmark Cards, Inc. estimates that greeting card sales have plummeted from 6 billion to 5 billion annually over the past decade. Earlier this month, the nation’s top greeting card maker announced it will close a plant that made one-third of its greeting cards and terminate over 300 jobs. This news should come as no surprise for Facebook users who use the social networking site to wish friends "Happy Birthday” or leave a comment of condolence after the death of a loved one. Facebook now boasts 1 billion users world-wide, and for many of those users the custom of offering birthday greetings has changed. Humans have been wishing each other birthday greetings for millennia. Even in the Torah there is mention of a birthday celebration (Pharaoh), but over the years, the way in which we mark each other’s birthday milestones has changed. Never has this change been as drastic as in recent years as Facebook usage has increased exponentially. While individuals still send paper birthday cards to close friends and relatives on their birthday, many transitioned to online greeting cards as the Web developed. (Hallmark’s main rival company, American Greetings, is adding jobs now because of its move to online birthday cards.) Picking up the phone to call our best friends and relatives on their birthday is still practiced, but it is also now acceptable to send an email or text message of birthday greetings as well. Where Facebook has become the “killer app” and disruptor in the culture of sending birthday greetings is in its birthday feature on the sidebar. Each day beginning at midnight Facebook updates the birthday events box on each user’s sidebar alerting the user to birthdays being celebrated on that day. Prior to this feature individuals had to rely on their own information in an address book or birthdays manually inputted into a calendar. These daily reminders are appreciated by active Facebook users as forgetting birthdays is now mostly a thing of the past. 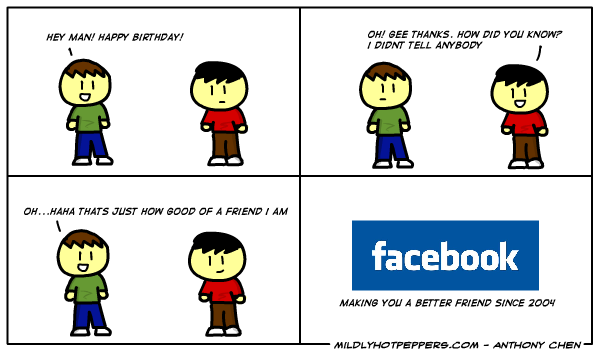 At first Facebook simply listed the friends celebrating birthdays on that day in the sidebar box, but within the past couple years the company realized how prevalent the custom of posting birthday greetings on friends’ Facebook Walls had become and instituted a simpler way of posting. Now users are given a text box next to each birthday celebrant’s name to easily leave a birthday greeting or wish. Past and future birthdays are also listed on the Facebook user’s calendar. Earlier this month, Facebook began showing friends’ birthdays at the top of its mobile site with a gift icon next to the birthday celebrant’s name. Clicking through this icon allows the user to send a birthday gift with Facebook taking a cut of the profit. With Facebook’s assistance people are now wishing “Happy Birthday” to people whose birthdays they historically wouldn’t have acknowledged (long lost elementary school classmates and former colleagues), but some say it hasn’t changed the way they still mark the milestones of close friends. “Facebook doesn't change the way I handle birthdays I always acknowledged in the past, but I still like to send paper birthday cards to my close family and a few friends. But I do offer birthday greetings to many of my Facebook friends -- it takes but a moment, and I think they enjoy it,” said Bobbie Lewis of Oak Park. 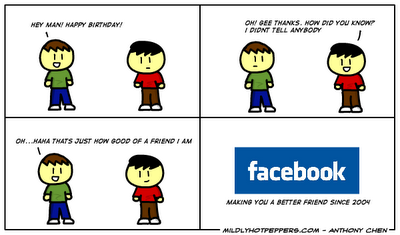 What is the protocol in responding to the barrage of birthday wishes Facebook users now receive annually? Lewis explained, “For those who send Facebook birthday greetings to me, I usually offer a generic response to all unless the birthday message is something more interesting and personal than “Happy Birthday.’ I know some people dislike this aspect of Facebook, but I don't mind it.” For Zuppke, with over 3,000 Facebook connections including many he doesn’t know or speak with on a regular basis, responding with one mass message at the end of the day thanking the group as a whole is sufficient. 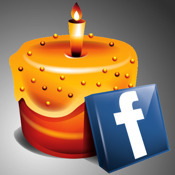 When it is Sherry Kanter’s birthday she simply acknowledges friends’ greetings with the ‘Like’ button. “I try to respond personally to as many as I can. It is a great way to keep in touch with people,” the Huntington Woods resident said. Interesting piece. In the days of a paper date book, I had the birthdays down of everyone I knew and laboriously copied them into the new date book every year. Then came the Palm and made that easier. But with both I was always "frum" about calling people on their birthdays. A friend once said, "You can count on three things in life: death, taxes and a call from Brian Abrahams on your birthday" Then came FB and suddenly people who had never wished others a b-day before were doing it. I found the flood unappealing, mostly bc of the issue of how/if to respond, and because of that I took my own birthday off. And this year (m 50th) passed quietly, with only my closest friends and family, wishing me a happy birthday. And of course for someone who took care year in and year out to call people on their birthdays, it's been lost in the floods they receive. Not even saying it's all bad, but like you, very intrigued by the subject of FB birthday issues. Quite an informative post loved it seems to be real informative in regards to the Jewish community. Couple of weeks ago, I had a friend posting Bday wishes to another friend who had passed away in Dec 2012! Best example to prove the author's point! Very well written article! At this rate, soon FB population will out number world population!